Even as he spoke, President Viktor Yushchenko's face and hands told a story of his struggles - and Ukraine's. 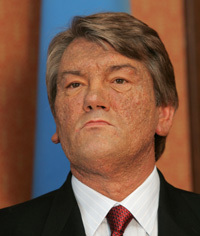 Above the smart dark suit and striped red tie Yushchenko wore for an interview this week, his face remained badly scarred three years after he suffered dioxin poisoning during his 2004 election campaign against Viktor Yanukovych - then, as now, the prime minister and Yushchenko's rival in a bitter power struggle. Below the cuffs, bandages on both palms were signs of Yushchenko's latest battle: He hurt his hands when he personally pitched in to fight a forest fire raging in southern Ukraine late last month, a well-publicized show of concern for the country before crucial parliamentary elections Sept. 30. The vote, the product of a hard-won agreement between Yanukovych and Yushchenko, is meant to ease a confrontation that has paralyzed politics in the former Soviet republic and denied its 47 million people the sense of normalcy they have been desperate for since Ukraine gained independence in the Soviet collapse of 1991. The pro-Western Yushchenko and the more Russian-leaning Yanukovych have been wrestling for dominance since 2004, when Yushchenko led the Orange Revolution - massive street protests denouncing fraud during the presidential election in which Yanukovych was initially declared the winner. The Supreme Court threw out the results, and Yushchenko won a rerun. But Yanukovych's party gained the most seats in March 2006 parliamentary elections, propelling him back into the prime minister's post and ushering in a Cabinet that has opposed Yushchenko. Speaking to The Associated Press in his office, Yushchenko predicted that this time around, his side would come out on top. He expressed confidence that his supporters and erstwhile Orange Revolution allies - what he calls the democratic forces - could gain enough seats to push Yanukovych's government from power and end the crisis. "I think that there are more Orange forces," he said. "So today the possibility of forming a democratic government is very high." Others were not so sure. Analysts have said the vote is unlikely to shift the balance of power and resolve the issue of who is in charge. Polls suggest all three major parties - Yushchenko's Our Ukraine, Yanukovych's Party of Regions and the party led by Yushchenko's Orange Revolution ally Yulia Tymoshenko - could win about the same number of seats as in March 2006. That would leave Yanukovych with plenty of pull when it comes to forming a governing coalition. Yushchenko's prospects are also clouded by his fragile relationship with his most powerful potential coalition ally, Tymoshenko, whom he fired as prime minister in 2005. He spoke of the need for "consolidation" of the forces in opposition to Yanukovych, bringing his hands together and intertwining his fingers as if trying to physically will a process he said "requires big efforts." Despite the uncertainty, Yushchenko said the elections were a chance for Ukraine to shrug off what he called the "lost years" of political crisis and tackle the problems, most notably official corruption, that have plagued the country since independence. A former central bank chief and prime minister, Yushchenko pointed to economic achievements he stressed came despite his lack of support in parliament. But he acknowledged that they may not satisfy the people's desire to "get a better life and get it quicker," after decades of privations. Average wages have risen by 50 percent over three years, and the economy is growing by about 8 percent annually, he said. "One must understand the conditions in which the president works. There was not a single day when I had a majority in parliament," he said. Yushchenko has pushed integration with the European Union and NATO and sought to decrease Russia's influence on Ukraine, most of which was dominated by Moscow for centuries. His foreign policy agenda has been hampered by the government of Yanukovych, who has warmer ties with Moscow and strong support in the largely Russian-speaking east. Yushchenko suggested that eventual integration with Europe was a foregone conclusion, noting that the EU is Ukraine's leading trade partner and pointing to projects linking the two in energy, space and other industries. But he acknowledged the rift that has aggravated the country's post-Soviet turmoil, saying it was etched over centuries in which there was no Ukrainian state and its lands were controlled by external powers - mainly Poland and Russia. The shadow of the Soviet era is still so strong, he said, that some Ukrainians will never be swayed to support his policies. "I understand that a portion of the nation was formed under an alien ideology, under alien propaganda, orientation - that to convince a certain portion of the people that this country needs European ideals and values is very difficult," Yushchenko said. "In fact, maybe it will be beyond my power to convince some." It may only be time that can heal the divisions and ensure that Ukraine thrives, he suggested. "It's not easy for a nation of 50 million to reformat its fundamental concept of values - a nation that has just emerged from an empire," he said. "It's labor, serious work." Ukraine's youth, he said, "are already different people. ... They understand more clearly who we were and where we are going. "And this, of course, creates great optimism. This gives strength and energy; and this is what we must live for."